"My journey opens to Kaua'i. Hi'iaka- Pele's younger sister is attributed to bringing Lohiau the young chief of Kauai, back to life with her healing powers and her love, when he is twice killed by jealous Pele. 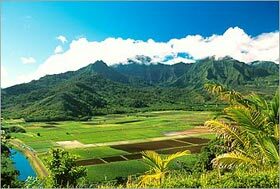 Kauai has a legendary history of being a place for healers and healing. Kauai as an island community has healed from two hurricanes in the past 20 years. Kauai residents are proud of their Unconquored Kingdom home. Kauaians continue to demonstrate an independent streak that sets this island apart from the rest of the Hawaiian islands. In addition to approximately 50,000 people and hosting over a million visitors a year, Kauai is also home to a small population of endangered Monk Seals and a winter residence for Golden Plovers and Hump Back Whales commuting down by air and sea from Alaska. The Kileauea Light House & Bird Sanctuary is one of the best places in the state to see Albatross, Shearwaters and other migratory sea birds nesting. Kokee's forests provide rare habitat to native endangered forest dwelling birds. On both the South and NOrth Shores, The National Tropical Botanical Garden houses and propogates exotic, tropical and endangered plant species. Many healers have also made Kauai home and offer their practices and healing arts to both visitors and residents. Along with the whales, world leaders, teachers, artists and writers come here to rest and rejuvenate and be re-inspired. Kauai is a great place to combine taking a personal growth workshop with a vacation. Kauai's beauty is world renowned for kayaking, hiking and beautiful beaches, and perhaps it is the enticing playful quality of being outside in nature's mana that makes Kauai a unique Health and Wellness destination. To fully appreciate Kauai, savvy visitors allow time to feel part of the Ohana (family) of this island. Kauai is a good place to turn off the TV and reconnect with yourself and simple pleasures. It is not uncommon for visitors to participate in beach clean up days, drop in and soak up a free slack key music concert, shop at the local farmer's market for fresh produce or flowers, attend a local church service, take a workshop, volunteer at a botanical garden, watching a community play or find themselves involved in a community project like the Kokee annual bird count during their stay. Perhaps contributing to Kauai is part of the "magic" healing process at work here too. Please feel free to "adapt" Kauai while you are here, and take care of the 'aina as if the island were a rare treasure or beloved family member. The Kauai Health Guide can help you locate medical facilities, massage therapists, unique accommodations, kayak rentals, locate current events, introduce you to the health practitioners and a wide array of healing techniques and provide a safety guide to hiking and ocean sports activities on Kauai. The Kauai Health Guide is partially sponsored by grants from the Kauai Office of Economic Development and the HTA. Plan ahead, or find out what's happening on the Garden Island today: Music, Workshops & Classes, Family Events, Sports, Festivals, Exhibits, and more. Early detection system for breast cancer in Honolulu does not involve x-rays. Joan Conrow: Rivers, Streams & Oceans- Exploring Kauai by water. Relaxing, Theraputic, Mystical: Massage traditions merge in Hawaii.